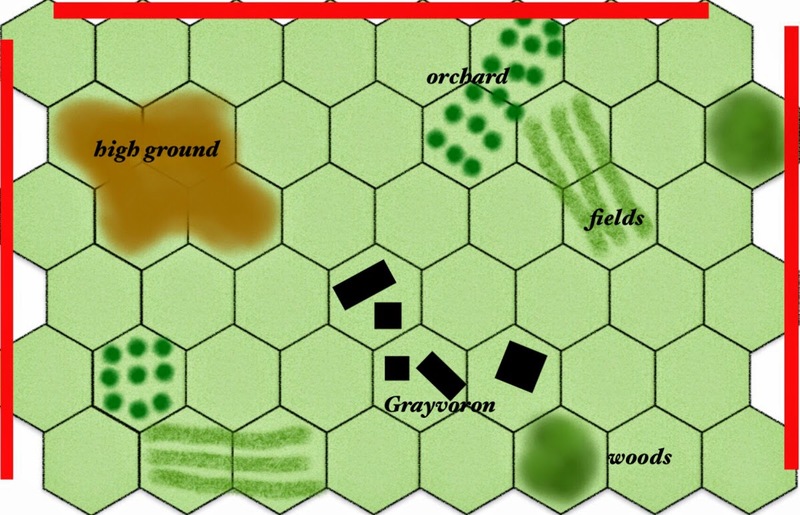 The fine tuning of my WWII tactical rules for hexes continues. Tonight I put out Scenario 3 - (Kampfgruppe Sivers) to test for balance and played it a couple of times. There are still rule amendments coming out of these replays. Please click on the 'read more' tag for the rest of this post. Background - On 8th August 1943, KG Sivers' retreat brought them to Grayvoron, where they setup an all-around defence. The Soviets had been trying to cut off the German retreat, but their T-34's had already taken heavy losses as they engaged with the Panther tanks. A new attack went in with T34's and tank riders. Eight of those tanks were destroyed and the remainder retreated. The following day, KG Sivers linked up with the Grossdeutschland Division near Akhtyrka. This is an interesting scenario in that it has quite a bit of replayablity if the players wish to explore differing directions of attack. The Germans set up first, in or adjacent to the town. The Soviets then select just one baseline from the three edges available (West / north / East) and they enter the board from that chosen board edge. They have limited time to drive the German morale level down to zero by inflicting casualties. The obvious attack route initially appears to be via the bottom right as this is the shortest way into the town. However with the absence of any cover, a good German defence can bring withering fire onto the tanks and the tank riders and they may not have the strength to fight their way into the town. 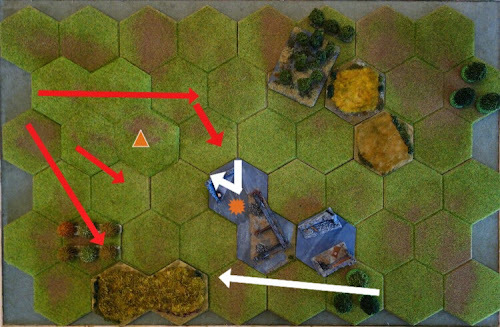 Because of this, the German player is bound to set up to protect themselves from an early assault from this direction. For todays game, I decided to change my usual play plan and instead attack from the West (left) using the high ground to conceal the first part of the advance and also have the artillery observer spot from the high ground, which will assist with their accuracy roll. The above key shows (white) the two Panther tanks that were forced to change positions to meet the unexpected direction of attack, the (orange) triangle shows the Artillery observer and the starburst shows the impact of the artillery off-board mission and the red arrows show the approaches of the T-34 tanks. 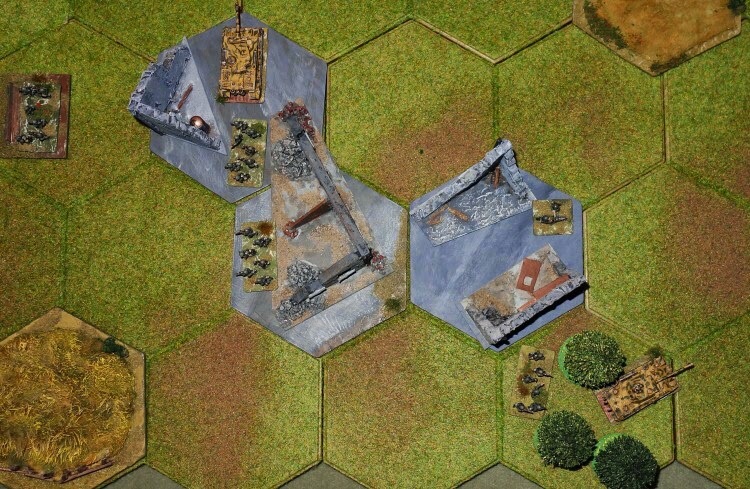 The above shows the German tanks in their original facing, the HMG in the right hand building hex and the entrenched infantry top left that is intended to force the enemy tank riders to deploy early, rather than letting them hit the town. 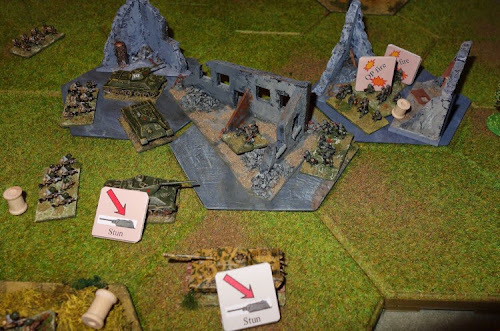 In the first turn, the panthers had to move to face the new attack and they did so without breaking down (scenario special rule due to the unreliability of Panthers at this time). The Soviets were able to use 2 hex movement because their first hex was out of enemy view. On turn 2 the Soviet observer gets into position on the high ground and the T-34's spread out to try and force the panthers to rotate in position (resulting in a fire penalty) to engage their targets. At the bottom edge of the map, two T-34's enter the orchard to get some cover, but the tank riders on one tank take a hit from the German HMG and have to abandon their ride. On Turn 3, the Soviet player opens the turn with accurate off-board artillery fire. This hits the northern edge of the town and causes the panther there to take a stun result. This is too good for the Russian tankers - who then abandon caution and move up to the town. Being adjacent to the panther will bring them a substantial attack bonus in the next turn. However, in their haste, they forget the potency of infantry against unsupported tanks. 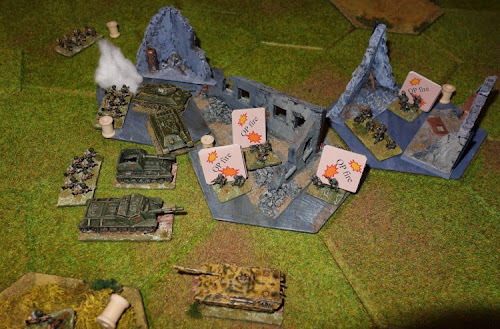 The defending panzer grenadiers (more firepower than standard rifle sections) move out to assault the isolated tanks and manage to destroy both tanks. The close assault rules require armoured vehicles that have taken 'hits' to convert these into an attack as though they had been struck by a strength 7 anti-tank value to represent close assault with satchel charge, grenades etc. However, this is proving a bit too powerful. Strength 7 is akin to bazooka / PzFaust type weapons, so I have now reduced these close combat type assaults to a value of 5. This being the case, only one of the vehicles above would have been destroyed if playing this under the new rule. Unsupported tank attacks against infantry remains unwise, but the outcomes are now a little less certain. The two losses contributed to an early collapse in Soviet morale and the attack stalled as units failing their morale check fell back a hex. 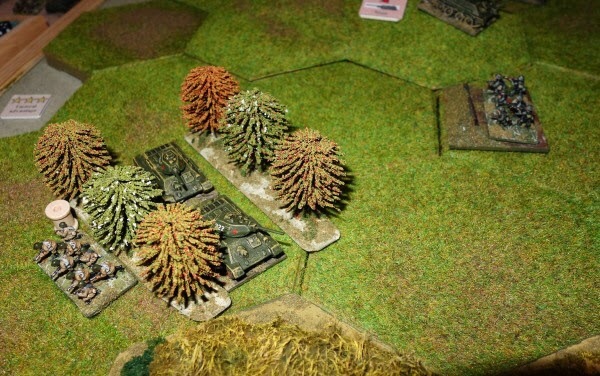 This gave German units a chance to recover from some pin results, lose some of their 'opportunity fire' markers and for the panther to recover from its stun status. Against this revitalised defence, the Soviets were too weak to renew their assault on the town and the scenario ended. With a couple of changes to rules sections, I ran the same set-up again. This time I had some tank riders with the T-34's that would try and move around the top of the town - to avoid the disaster of the last attack. Within a few turns there was mayhem across all of the town. This time the Soviet artillery knocked out a panther (just a bit of luck really) and that allowed the soviets to rapidly advance. The Germans took plenty of pin results, but they pulled those units back, deeper into the town to preserve them. The exposed Soviets took further hits, driving their morale down. 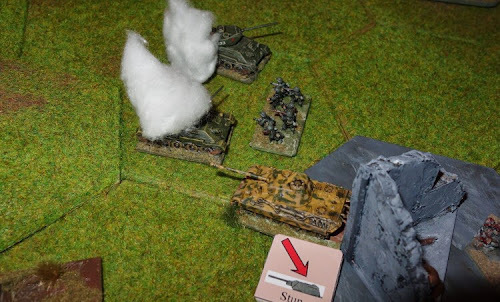 A few of the German units had both pin and opportunity fire markers on them, so it would take at least a couple of turns for them to straighten themselves out and return to fighting form (note in the above picture, I am using an SU 152 and an SU 76 model to represent two of the six T-34's while my collection slowly builds). When advancing the game clock, twice I rolled double six, this really moved the clock forward quickly, much to the disadvantage of the Soviet player and each time, those doubles produced random events, so plenty of sub-system stuff going on there. The Germans continued to pull back pinned units, in the hope that they could reduce their losses, while Soviet losses grew. Both sides were seeing their moral drop towards the critical 'zero'. But the advance of the clock by 24 minutes in two turns meant the Soviets simply ran out of time and the Germans won. I played another couple of turns to see what would have happened if the Russians had had a little more time time, but it did not go well for them. Theirs was the first morale to hit zero and their morale tests failed on all units, causing them to totally lose their grip on the town. Overall it was a fairly tight battle with lots of interesting moments. Above is the eastern most town hex, which became a sanctaury for recovering German sections, holding them safe, just out of Soviet reach until the clock ran out. The rules are pretty tight now and I think that by time the remaining scenarios go through their final paces, I will be happy with them. Interesting update, caught the link to it over at TMP. In anticipation of the release of 'Into Battle' I have made myself 48 hexagons out of cork floor tile (as I could not afford to buy Hexon). I now need to get some colour/texture on them, don't suppose you've any suggestions for this have you, as I wish to avoid having them curl up at the edges due to shrinkage when drying? Glad to see you are getting some games now the pinboard project is done. And showing how enjoyable small games can be. I still find the odd thing to tinker with after 10 games or so with my WW2 rules (unlike my ancients rules that are still tinkered with after 30 games or so!). It is always the bits I have never tested that cause me grief. But it does sound like the rules are very close. How important is the hex grid? Could they be played with an offset square grid (which acts very similar), or even without a grid and x" = 1 hex? . Russ, excellent news, thanks for following the project. I would make up another rough tile with your off-cuts and test surfaces on that. Avoid a thick layer of PVA, that will draw back in the drying process. I think I would be tempted to try a non shrinking filler paste with a small amount of acrylic paint mixed in. This can be scraped on VERY thinly, missing in some parts, sot of scratched on and then scratched off. that might give a good starting texture for subsequent painting or use a thick 'tacky' PVA in just small parts of the tile and get the flock attached to that. But I would certainly test before using your properly cut tiles. I had used foamboard and that was subject to warp (all the edges lift). Thank you, Norm I'll give it a try. Norm, I just wanted to say that your suggestion of non-shrinking filler paste mixed with acrylic paint has worked a treat, thanks! I'm really pleased about that, I was a bit bothered that after doing all that work, you would end up with some curl. 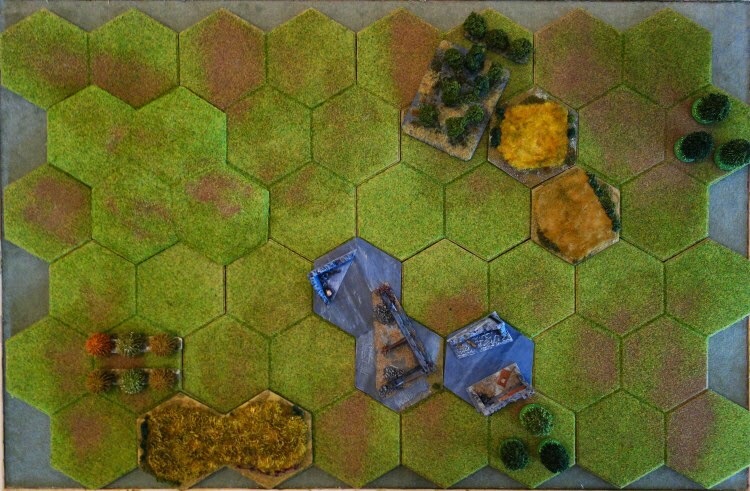 I used the non-shrinking filler on a Kallistra thin plastic template tile to do a marsh hex and that worked OK. 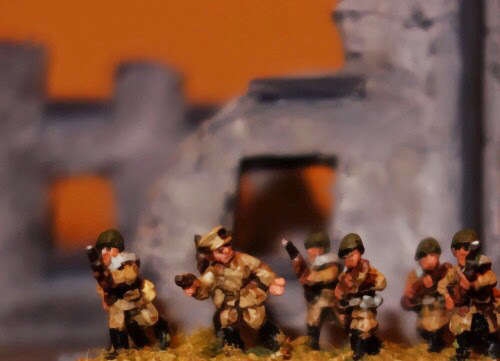 I have just posted an update (edit 4) to the 10mm hex based WWII AAR post that I made a month ago - see current the top 5 posts for a quick link, which may interest you. Hope to hear more of your hex project. Norm. Shaun, playesting just throws up the odd thing that I have not covered in the rules, so these games are really helping to get ambiguity out of the rules. Off set squares would be fine, it is just my brain that has been involved with boardgames since the late 70's instantly understands hexes. I did have a very early version on squares (not as elegant in my view due to armour facings etc) and I don't see any reason why a conversion to inches would be an issue. the hexes are 4" so that would make a ready conversion, with perhaps a couple of templates being made for artillery burst and so forth. 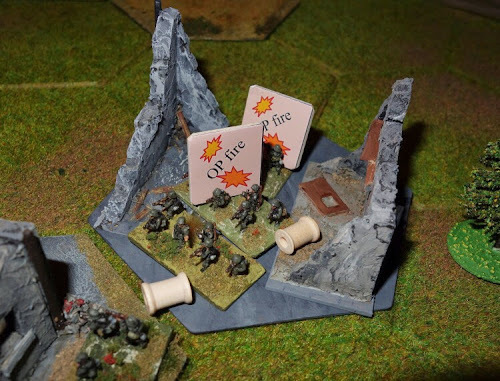 Non Armour Fire (NAF - yes sad I know) hits the who hex and casualties are distributed amongst units there and a hex with more than two infantry units gives a 'target rich' bonus, so as long as those can be worked in (easy) I see no problem with conversion. I started in 1979 with mins for a few years and then played hex boardgames for the next 15 years almost exclusively so I am with you when it comes to hexes. But, other than Squad leader, never played low level WW2 games with hexes. So I find it had to reconcile WW2 miniature gaming with hexes. I am sure I will get over it one day :-) I have mentioned it before that I do like the idea of a grid of some sort - it would make things a lot easier. I am just looking for ways to slowly come to terms with hex based miniature games. And off-squares will be easier to mark out on a small board. And NAF is sad :-) Acronyms can be cruel. But I like it. Sorry, my reply locked and stopped me posting further (that keeps happening - is it just me?) The game has facings, with tanks and guns pointing to a hex vertex, to convert, just give these units a frontal fire arc of 120 degrees and anything outside of that gets a penalty as given in the rules. For spotting you would just have the terrain feature blocking rather than the whole hex as the rules do in their present format. Norm, I have not had reply blocking ever on any blog.